Eagerly awaited second double CD release by this improvising rock group referencing the keyboard improvisations of Terry Riley, Krautrock style exploration, plus contemporary electronic and orchestral music via extensive use of strings and voices. This second collection, strengthened by a consolidated and expanded line-up, builds on the foundations laid on the first release. In a word, wow. That's how our review of the debut, 2012 Orchestra Of The Upper Atmosphere release wrapped up, after several gushing paragraphs. Let's cut to the chase and simply open this review the same way; in a word, wow! This 2nd Orchestra Of The Upper Atmosphere double cd set is their 2nd Aquarius Record Of The Week, and that was an easy decision to make. Nobody else out there sounds like this, 'cause nobody else out there thinks this BIG, and combines all these elements so perfectly - experimental electronics, improv jazz, avant-classical choral music, chamber rock, modern minimalism, pulsating krautrock beats, progressive symphonics, ambient drone, and much more. Possibly you could liken the OUA to a 'big band' version of Norway's Supersilent, just possibly, to get started. Aptly named, this Orchestra is a large scale project, and it's no wonder, so far, that they always make fully-packed double disc sets. Led by Martin Archer (who appeared on another recent aQ list with the latest from the avant-industrial Combat Astronomy project, of which he is part) and Chris Bywater, the UK's Orchestra Of The Upper Atmosphere is indeed a large ensemble, the multi-instrumental Archer/Bywater duo (organ, electronics, electric piano, saxophones, clarinet, synthesizers, samples, percussion, voice, electric violin, etc., etc.) joined by a half dozen additional musicians bringing in everything from electric bass to flutes to glockenspiel, that core unit then further augmented by the participation of various satellite groups with which there is some overlap of personnel: the 20-person Juxtavoices chorus, the La Garotte String Quartet, and The Divine Winds. While the first OUA album took several years to complete, this one came together in a shorter span of time, constructed from edits of live improvisations, and is no less impressive for that. It's mysterious and moody, as well as active and dramatic - when the Juxtavoices get involved, look out! The first disc begins with "Dominant Growth Direction" - a powerful intro that zooms and whooshes with such physical heft, heck it should be used for the Dolby THX they play in the movie theater before the movie starts. That's followed by the beautiful, haunting grooves of "Paratacamite"; more atmospheric even is the next track, "Bilateral Coordination Activities Are Calming", featuring field recordings (birds, water) woven in among the drones and woodwinds and percussive sounds. Next, "Modus" is a glitchy avant-funk fusion jam, like some sort of electric Miles meets This Heat hybrid, with a definite David Shire "Taking Of Pelham 1-2-3" suspense soundtrack vibe as well. Want some even more out there 'band math' from this review? Skip ahead to disc one's blissfully grooving 14+ minute finale, which we're thinkin' sounds like a spaced out Oren Ambarchi/Augustus Pablo collaboration!! The genre-defying UK outfit whip up a storm. Martin Archer’s UK ensemble have a tune called The Breaking Of The Bonds & The Rearrangement Of The Atoms, and this nicely sums up their distinctive sound. Wow! Es wird also doch noch wirklich progressive Rockmusik gemacht! ... Und das Orchestra of the Upper Atmosphere (OUA) tut das auch auf seinem zweiten Album. Das O des Orchestra ist nun ein großes griechisches Theta und dementsprechend heißt der Zweitling "T2" (leider wird das T vom System der BBS im Albumnamen nicht korrekt dargestellt - hier im Text geht das). Martin Archer hat die Besetzung der "Band" leicht erweitert, ansonsten sind hier die Musiker beteiligt, die schon auf dem Erstling zu hören waren, ergänzt - wie gehabt - um den Chor Juxtavoices, das La Garotte Streichquartett und die zum Duo geschrumpfte "Bläsertruppe" The Divine Winds. "We aim, by scope, scale and creativity of our work, once more to astonish you", teilen die Musiker mit und das ist ihnen mit Sicherheit gelungen, sowohl was den Umfang, die Tragweite und die Kreativität des hier Gebotenen anbelangt. Aus zwei sehr gut gefüllten CDs besteht "T2" und um deren Inhalt wirklich gerecht zu werden, müsste man hier wohl mehrere Seiten an Text hinterlassen. Aufgenommen wurde die Musik von der OUA-Kernband, meistenteils live improvisiert, im November 2013. Danach wurden die Mitschnitte um viele weitere Tonspuren ergänzt (u.a. die Streicher und der Chor), bearbeitet und fertig abgemischt. Das Projekt bezeichnet sich selbst als (Zitat) "an improvisation based rock group referencing the innovations of Terry Riley, Magma, Krautrock style explorations, Sun Ra and Alice Coltrane", was die Sache ganz gut trifft (wobei ich wenig Zeuhl höre), aber das klangliche Ergebnis auch nur unzureichend beschreibt. Ich würde als stilistische Referenzen noch Jazzrock und Canterburyartiges, zeitgenössische Kammermusik, Postrock und Elektronik hinzufügen. Aus all diesem formen Archer und Kollegen, ergänzt um sehr viel Eigenes, Freiformatiges, Schwebendes, Waberndes, Dröhnendes, Klangmalendes, Virtuoses und Kreatives, fast 160 Minuten an spannender, progressiver und dabei sehr unterhaltsamer, will sagen nicht übermäßig anstrengender oder schräger Musik. Sehr farbig eingesetzte Elektronik und verschiedene Tastensounds bestimmen die musikalische Grundlage von "T2", über der sich allerlei weitere Klänge erheben, Bassmuster, Perkussives, Gebläse, Streicher und nicht selten die mysteriös-geheimnisvollen Textrezitationen und Gesänge der Juxtavoices. Allerlei solistische Ausflüge an Beblasenem und Geige gibt es zudem, immer wieder repetitiv-verspieltes Georgel à la Riley, flächige Einlagen des Streichquartetts und sehr viel Klang, Atmosphäre und Farbe. Eher getragen und flächig gleitet die Musik voran, meist mächtig und voluminös, bisweilen rhythmisch rockend, mitunter eher freiformatig schwebend. Manchmal gerät das Gebotene zu einer Art Jammen à la Miles Davis (man höre "Modus" - natürlich mit solistischer, verfremdeter Trompete), verwandelt sich die Musik in ein verrocktes klassisches Ensemblewerk (z.B. in "Space smells of strawberries"), in retrokrautig-elektronische, experimentell-avantgardistische Soundlandschaften (man lausche "Bilateral coordination activities are calming") oder die Musiker dümpeln auch mal repetitiv-postrockig dahin ("Paratacmite" - mit "A-Rainbow-in-Curved-Air"-Terry-Riley-Orgel - sei als Beispiel genannt). Aber, es gibt hier sehr viel mehr zu entdecken, das alles zu beschreiben den Rahmen dieser Rezension sprengen würde. Over in the U.K, Discus Music is continuing to release very adventurous music and high on the list in 2014 is Orchestra Of The Upper Atmosphere. 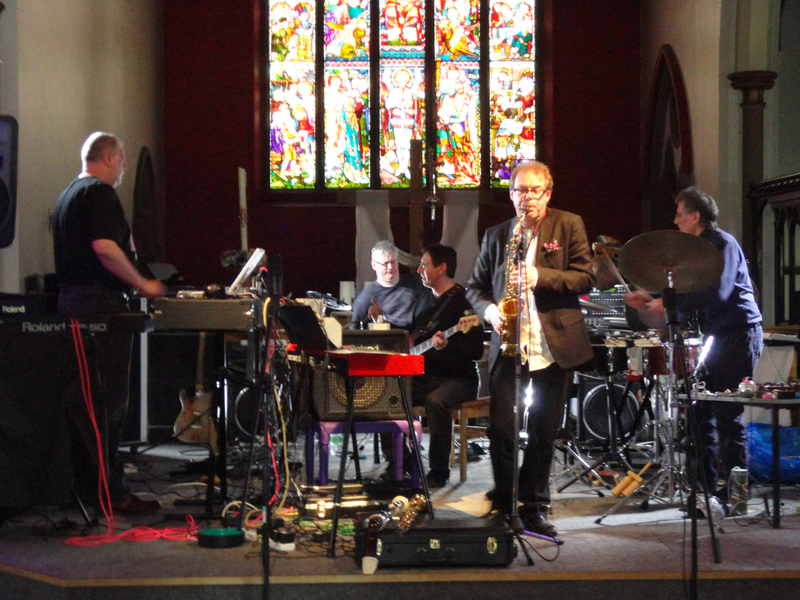 A large scale, double CD project, the OUA features a number of musicians, headed up by multi-instrumentalist Martin Archer. Musically, the double CD is very much in the spirit of massive UK art-rock projects such as Keith Tippett’s Centipede along with more ancient sounding works by Terry Riley, France’s Magma, various types of Krautrock as well as influences from Sun Ra, to name a few. The astonishing sounding double OUA CD covers such a wide range of sonic moves, that it will get your head spinning in short order. Amazingly, Orchestra Of The Upper Atmosphere features a “working band” sound throughout, with the musicians recording in the studio over a two day period, all carefully edited and orchestrated to form a massive finished work. Those lucky enough to hear Orchestra Of The Upper Atmosphere will be amazed by the meticulous care and construction of a fascinating album that will be viewed as one of the great sonic accomplishments of 2014. - PSYCHEDELIC WORLD MUSIC. 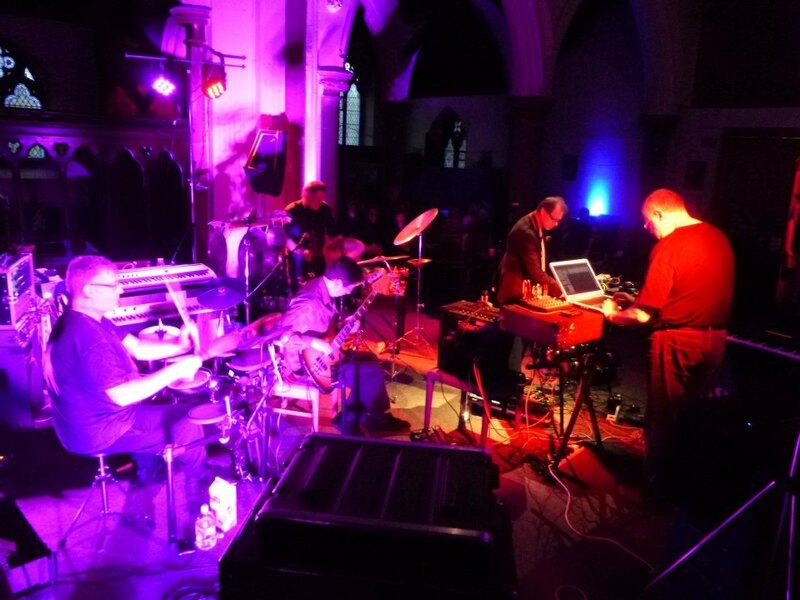 Last year, I published a brief summary of Sheffield improvisational genre-defying sound architect Martin Archer’s releases on his own Discus Records imprint. One of those albums was the double-disc debut of Archer’s large ensemble, Orchestra of the Upper Atmosphere, released in 2012. Not long after my piece, that group’s second offering, another massive double CD entitled O2 hit the virtual shelves. A vast trip into the Kosmische beyond, this then is what we did, the week after we joined Satchidananda on a trip into the innermost vast expanses, running the gamut from dark industrial ambience of Stapleton-like glower through improvisational Krautrock and on to delicate space noise received from an unimaginable distance, via chamber rock, funk and modern classical music, this is BIG music so you better strap yourself in. Judging by the lighting, or lack of it, one can only assume that OAU are blessed with faces made for radio! Fleeting half-lit glimpses of various band members occur throughout the video, crafting sonic sculptures in real time. Echoes of the electronic atmospherics of Terry Riley are intermittent features, and the attendant looping is a technique used in just the right amount and in the right places, as the final four or so minutes of opener Dominant Growth Direction testifies, beginning with a repeated and haunting flute refrain as the piece drifts rudderless into the great beyond. Fully formed wordless vocals make an appearance on Paratacamite, and again looping is used to create layers of ethereal sound. The voices are provided by Juxtavoices, an “anti-choir” whose extraordinary and quite captivating album I reviewed a while back. The looped and layered voices with the attendant repeated instrumental refrain, topped off with disembodied synth space whispering, chattering percussion and fractured organ create a mantra-like experience reminiscent of early Krautrock. Like that now ancient but nonetheless ground-breaking music, OAU are free of any standard Western rock/blues tropes, and are at large to roam where they will. Paracatamite is my personal album highlight, as I find it completely hypnotic and always offering something new. Although based on improvisation, the fact that this second outing for the collective was recorded over a matter of weeks and then followed by later additions and production tweaks lends O2 a more composed and structured feel than the debut, which took far longer to put together, and was an altogether more disparate project. This is a “big band”, but of course not in the traditional sense. Keith Tippett’s Centipede, or Chris McGregor’s Brotherhood Of Breath come to mind, but with much added modernistic electronic pizzazz. There is a strong Krautrock influence, and I can only imagine that Martin is a fan of the more obscure corners of the German underground music scene, for I am sure I can hear a fleeting visits from the ghost of Eroc here, the spirit of Xhol Caravan there, as well as the more well-known bands from that wonderfully free and unrestricted scene. Not that this is an attempt to recreate the past, far from it, for all these influences and more come together to form an organic and living whole. The first CD of O2 is the more dynamically energised of the two, and epic opener Dominant Growth Direction weaves synth trails through the sky to the backing of the insistent drums and bass. The sawing string section and keyboard cake icing eventually lead to a plateau of looped flute as the piece becomes becalmed, arriving at an alien synth-symphonic awakening before drifting off in an unsettling percussive and vocal stirring of darker things. Strangeitude is on offer aplenty on the snappily titled Bilateral Coordination Activities Are Calming and here an avant direction into Stapleton territory is taken. The piece is, given its title, strangely disquieting and deliberately disjointed, full of weird aural surprises. And so it goes…uncompromising yet engaging, spiky yet loveable, this creature repays the time invested in it by the listener with added interest. The remaining three pieces on CD 1 are equally as interesting as what has gone before, with soundtracks from the alien cinema giving way to displaced spatial jazz accompanied by dub rhythms. Space may indeed smell of strawberries in this alternate universe where the stately progress of a space junk across the Kosmische expanses encounters monstrous sweeping string sections and nervous alien chatter bowing before Zeuhl choirs. Becalmed, slowly drifting through the inter-galactic debris, carried on unseen currents and buffeted by solar winds, with the bass, drums and percussion once more playing a leading role, the first CD pitches and yaws to a close. The skilled production techniques on all of this are sympathetically epic, and suffice to say this is music for those of us who are always looking for the edge of the envelope, but having said that, none of this is wilfully strange or deliberately alienating. The conservative music fan may even find it awakens a dormant or even hitherto undisturbed questing spirit within – one can but hope! The second CD goes off on a (tangerine) dream-trip, commencing with The Breaking Of Bonds & The Rearrangement Of Atoms building castles of sound in the air, looping layer upon layer over an evidently human rhythm. With only four long tracks filling the77 minutes of this CD, each piece is given all the time it needs to breathe and grow. Nothing is rushed, and this reflected in the slow and measured meter of the tracks, which are never dull, filled as they are with all kinds of sonic embellishment. A problem with long tracks within conventional rock parameters is often a lack of dynamics, or at the other end of the scale, a feeling of being complicated for the sake of it. Neither of those criticisms apply here, for there are no restrictive boundaries or conventions, resulting in an endless capacity to surprise, a characteristic of all good improvisational music. Curvature Of The Earth while initially calm and meditative slowly builds to a symphonic crescendo courtesy of the swooping and soaring string section that witnesses the sun rising over the horizon in such resplendent majesty that it leaves the listener feeling small and insignificant. This is spacerock baby, but of a different kind. No journey to the innermost nooks and crannies of the psyche would be complete without a disturbance, and RMMV Asturias quietly builds a palpable tension, atonal strings following by doom-laden bass and drum taking us to a land of disquiet. This continues into Potent Lunation, where Steve Dinsdale’s drums clatter around the beat taking on the role of an agitated monkey in a cage aware that the drugs are wearing off. The simian patient is stirring to the sound of the dislocated string section and chattering reeds and brass. The anti-choir appear near the end in a Magma fashion, the drums now locked into a monolithic beat with the bass as shards of mellotron-like synth compete with sawing strings in an effort to break free of the ties that bind. The second album (and the second double album) by the Orchestra of the Upper Atmosphere, a British band whose core consists of Martin Archer, Chris Bywater, and Steve Dinsdale, among others. Think instrumental progressive/psychedelic rock blended it with experimentation. The album's tracks were borne out of collective improvisations, to which layers of composed material were added later, especially string quartet and choir interventions. I spent a lot of time with this record before writing about it, because it's long, dense, and ultimately very good. "Space Smells of Strawberries" has a strong "Atom Heart Mother" flavour that I truly like, and disc 1 as a whole is top notch. Disc 2 features four very long tracks that overstay their welcome, but I was able to appreciate it more when I approached it as a different proposition (i.e. at a different time). Is this one better than their debut? Honestly, that's too hard of a question. - FRANCOIS COUTURE, MONSIEUR DELIRE. On ‘θ2’ I total get it right the way through an uncompromisingly sprawling 2 CD recording which is, in effect, the equivalent of 8 side of vinyl. The comprehensive use of keyboards (Archer and Chris Bywater), haunting female vocals, a string quartet and a wind section, the latter sparingly but decisively deployed, is a masterstroke. But most of it all is the intrusion of melody and riff and an undemonstrative but effective rhythm section of Terry Todd and Steve Dinsdale that elevates the music beyond minimalism and noise into the stratosphere as the title suggests. The opener with its wild ‘classical’ introduction (Stravinsky/ Bartok in extremis) reminds me of an ever vigilant and irascible flower (a Venus fly trap perhaps) in a furious cycle of activity and recession and by the time the wondrous repetition and comforting familiarity of ‘Paratacimite’ comes round I begin to believe this music truly has magical properties as the synthesis of Bywater and Dinsdale return us to planet Earth. Experienced best through headphones (not ones that leak like ill-considered street lights) θ2 is mprovisational ‘spacey’ rock/ classical at its best. On the Rhodes driven ‘Modus’ with its funky bass, Archer employs is Eb sax (At intervals he also plays clarinet and trumpet on the album). ‘Noctilucent’ has another hypnotic bassline at its root while Archer’s fervid imagination finds full expression on the intriguingly entitled ‘Space Smells of Strawberries’, a string infused, filmic flight of fancy.